Hello everyone!! I just love the 2nd Friday of the month--it's a Pink-alicious Blog Hop night!! If you have just come from Edna's amazing blog Create with Expression, then you are in the right place. If not, make sure to head over to My Pink Stamper so you can enjoy all the projects! Today's challenge is to make a Treat or Goodie Bag with any holiday them and we had to use Yummy-licious or Sweet Goodness. Mine is more of a box from Art Philosophy (of course!). This next view shows the side. It has a cut in the flaps you can't see so those sides just hook together. Then you finish off the top with ribbon, or twine like I did. These will go together so quickly and would make great treat boxes for school kids too! This was so super easy to put together! I think I'm going to get some more of this paper and make these for some co-worker's for Christmas and probably put some peppermints in them. Your next stop is Agnes and her fabulous Flowerdisco's Scrap Hut blog. When you make it to the end, m ake sure to go back to My Pink Stamper to see where you can buy all her fabulous stamps and to link up your own project that you make for this challenge! Since you have made it to the end, I have a treat for one lucky comment! Please leave one comment with a way for me to get in touch with you for a chance to win a My Pink Stamper Spooky Puns stamp set. I will draw a winner on Tuesday and ship out as soon as I get the address so that you may have them in time for making Halloween goodies! Giveaway is over. Have fun and thanks for visiting. This is terrific Helen! I love the bling you added to the candy image! Love your treat box. So Cute. I am a follower. Cute box. Will have to look for that shape. I love you box and I could taste the peppermint!! so cute. love the paper! This is a great box! Love it! Love this box! Very cute! The paper is perfect! TFS! Love it - the paper is adorable! Another fabulous project Helen - adorable as always my friend!! 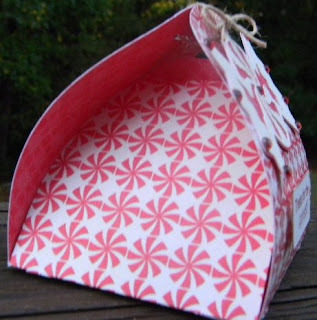 I am a huge MME fan and I love that paper you chose for your sweet boxes! I bet you are a big favorite with your co-workers! Sounds like a fun gift to make and receive! cute treat box. i love the peppermint candy on the front...thanks for the chance to win too! I am loving the Art Philosophy cartridge more and more everyday! Thank you for sharing your project. I love the peppermint theme! This is sooooooooo cute. I LOVE the candy cutout. I really like the box, very different and super cute! thanks for the chance to win! So cute, thanks for the chance to win. Very cute. Im loving this cartridge and see that Im needing to get it when I can. Oh your box is adorable! So need to get this cart. Thanks for sharing. The box is cute!! Thanks for the chance to win a set of stamps. Cute peppermint box! How fun would it be to receive this? Adorable! Very cute. Love the paper choices and the simplicity of it. Very cute treat box! I love all the peppermints! I love this adorable box! The paper just makes it even more eyecatching. So cute!! Thanks for sharing! That stamp set looks so cute!! Thanks for the chance to win! This is so cute! I love all the peppermints. I need this cartridge too. Sincee my hubby lost his job last year I havent been able to splurge and buy any new stamp sets. I SOOOO wish I could get some of Robins newer ones. Thanks for the chanceto win them! Oh yey!!! 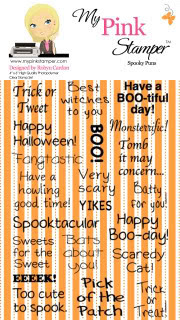 I need me some Halloween stamp set!! I just got 1 that say Happy Halloween!! Great project and great giveaway. My email is marg0006@verizon.net. I LOVE THIS BOX!! I have no idea why, but it reminds me of something Dutch...ANYWAY, I definitely want this cartridge. I can't wait to grab it! Take care!! Adorable! I want this cartridge. Great idea and great finished product. I saw your box and thought it is just adorable. I can see using this for party favors...wedding...endless possibilities. I love this shape . Thanx for a chance to win this stamp set. I have 4of Robyn's sets and they are awsome. This hop was great fun! Very cute - I'm going to make one! Thanks for the chance to win. Love the treat box. Looks like you could make a bunch of these quickly. Love the peppermints idea. TFS. What an elegant box! Great color and pattern combination. Thanks so much for sharing. What a cute box-love the paper! I might need this cartridge yet! That is a great little box. Super sweet. So very cute! I love the candy paper you used, perfect! Thank you so much! Spectacular Treat box. Love the theme and papers you chose. I may have to get this cart. Very cute treat box. Thanks for the chance to win. This came out so pretty! TFS! LOVE IT!!! This treat box is awesome. I just got Art Philosophy and can't wait to try this box. Fabulous little treat box. Love the colors you used and the bling. What a great bag, that Art Philosophy cart has some great cuts. Cute treat box! I really want the Art Philosophy Cart, you're such an enabler! What a cute little treat box! So cute, Helen! I love that candy die cut! It's one of my favorites! Very nice!! Love the peppermint candy cut!! This is so cute and I love that paper! I love this, so so so cute! TFS. Love the paper and the larger mint candy on the front. The bling adds just the right touch! Great job! Very cute bag/box. I liked that it was oddly shaped - very interesting! The paper was super cute too! That goodie bag is TOO CUTE!! You did a great job on it. Thanks so much for the chance to win some MPS stamps! I am loving everyone's treat bags and love the colors on yours! Thanks for the chance to win! So sweet! I love it and it looks like something I could do. Thank you sooo much! Thanks for sharing and for teh giveaway chance. Very cute treat box! Love it! Such a curte treat bag. I LOVE the paper..so pretty! love the paper :) Such a cute idea! I would love to win the stamp set! After this blog hop I have so many ideas for using this stamp set :-D TFS!! I just love these blog hops thanks for the chance to win. OMG, I love that treat box, I had no idea it was on that cart - I will be looking for that one! Great treat box. Thanks for sharing. wow... great hop. thanks for the opportunity! Yummy! Love the box and the paper you used to make it! Your treat box is very pretty! TFS! Oh how cute Helen, I love this treat box! The paper is so pretty, and I love the big peppermint! And thank you for the chance to win the stamps!!! This is so cute and looks like it was pretty simple to make. Great project! What a cool box! I need to open this cartridge up! So bright and cheery!! Love MME too! You really madea n adorable project! TFS!! And glad I found your blog! That is so cute Helen. TFS!! Great Job, Helen!! Wonderful hop and project!! Thanks for the chance to win!!! 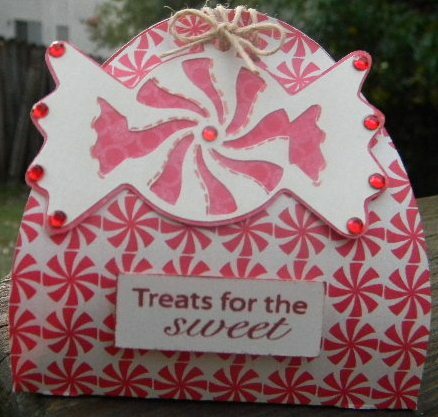 Love the sweets bag, the big candy tag to match the pattern paper is a great touch. and love the bling on the ends of the wrapper. thank you for sharing, and a chance to win. the box is super cute!